The bizarrely changed character of Wilikins. It's mentioned that he's a good fighter previously, though a slightly stuck-up butler to the aristocracy. Suddenly he's this rough and ready cutthroat who is on matey terms with Vimes? I'm all for character development, but this just felt weird. The convenient appearance of the Summoning Dark, which is barely mentioned in the latter half of the book, and is a plot thread just ignored completely by the end. The fact that the ostensibly primary villain of the piece, Lord Rust the Younger, has no dialogue, and in fact is not in a single scene and is only mentioned in the third person, means it's hard to care about him one way or the other. And the actual main villain, Stratford, is only in a handful of scenes towards the end of the book, and poses no real threat since Vimes is one step ahead of him the whole time. Very much a let-down. Not exactly, no. Just not as explicitly mentioned. I don't recall him being so... Right-Hand-Man-y as he was in this one. But I don't know how much of that is "wrong" characterization, and how much is character development that just wasn't on screen. I mean, the events of THUD are spoken of as if they happened several years ago, so there is that. That being said, I can't really fault your other complaints. It... wasn't as well-written as his other works, and redoes themes from the previous book, only a bit more simply. I agree that Wilikins' character has abruptly changed. He's always been a good fighter, but the whole point of his character was the contrast between his extremely proper manners as a butler and his rough background. And then suddenly he's this thug who is completely informal with Vimes? It seems like a bizarre about-face with little explanation to me. I also agree with the rest of the rest of the complaints... Snuff is definitely a contender from Worst Discworld Book in my opinion. I think it shows the way that over the years Wilkins and Vimes have become friends of a sort, which I'd imagine you would after having a person be with you for most of your day, helping you dress, shave, prepare for the day etc. I wouldn't say he's a thug or that he's comletely informal with Vimes, infact a point is made that he's not when he refuses to sit and drink with Vimes when they first reach the house. I think Wilkins is being portraid as the best butler/ manservant he can be; he guards his employer's family and things with his life and carries out deeds that the employer would like but would never do or ask for. The only complaint I really had for the book is that the plot didn't seem his best but after so many books that's hardly a massiv complaint. That said I would love more Vimes books, I would even like a Carrot/Angua orientated one but I think that would only come out if the basis of their storyline is Vimes' death. Have any of you read Strata? I came across a copy in a used book store long ago; it might even have had a Kidby cover, or at least something Kidbyesque. However, in the intervening years, having failed utterly to find any reference to a tale of space explorers discovering Discworld, I thought I must be mistaken – until I finally found another copy recently. Jorpho wrote: Have any of you read Strata? I came across a copy in a used book store long ago; it might even have had a Kidby cover, or at least something Kidbyesque. However, in the intervening years, having failed utterly to find any reference to a tale of space explorers discovering Discworld, I thought I must be mistaken – until I finally found another copy recently. I read it long ago, and forgot most of what happened. However, I do remember that even fairly early on in Discworld canon it becomes pretty clear that Strata is more like "Hey, what if there was a sci-fi-ish way to have a Discworld?" 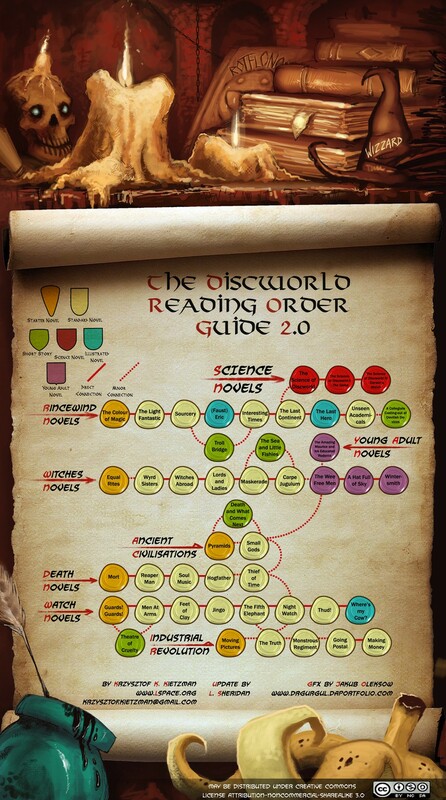 rather than "The Discworld is really a sci-fi thing explained by the Clarkian Axiom". I thought Strata read pretty much like a Ringworld parody. Not related to Discworld in any way, but a similar space construction, explored by a human and two aliens. Yeah, I'm pretty sure Strata was not meant to be related to the discworld. It predates it and is supposed to stand alone. Yeah, a lot of the geology of Strata made it to Discworld, but that's about it. I felt like it was a great idea at the time, but maybe he felt there was more he could do with it and kind of rehashed it for Rincewind and that took off. I really loved that book! I, too, found it in a used book store and thought it was one of the best books I'd read. Sadly I gave it to a friend to read and I doubt he ever did. I'd love to have it to peruse every few years. The next Discworld novel will be called Raising Steam - no other details or a publication date yet though. I just really liked Thud! Least favorite would probably be Moving Pictures; couldn't bring myself to read that one again. When you don't know, the answer is a witch did it. With magic. I finally got around to reading Strata. I think it lacks some of the intricacy of his later books; there are a lot of clever concepts that a different author might have fleshed out a lot more. Still, it's a neat little story, and I say that without ever having read Ringworld. The next Discworld book (Raising Steam) is confirmed for late October. Finally got around to reading Hogfather. I still prefer Thief of Time; this one was a little bit too rambly, I think. Should I bother with the BBC series? Jorpho wrote: Finally got around to reading Hogfather. I still prefer Thief of Time; this one was a little bit too rambly, I think. It was Sky rather than the BBC, and I'd say 'no'. In Discworld-related news, "Raising Steam" apparently comes out today, although I saw it in a store yesterday. I would have bought it, but I'm still working through "The Long War". Also, would someone with Hogfather mind sending me the description of the Eater of socks? I think it's on page 203, as google books has decided to not preview that specific page!!! For various reasons I've never actually read any Discworld and recently decided that maybe I should do that. Trouble is, there's a lot of Discworld and I have no idea where to start. Is there any place in particular I should? It so happens there is a well-established Reading Order Guide. The Rincewind novels were the earliest, but I prefer the other starting points, personally. EdgarJPublius wrote: Trouble is, there's a lot of Discworld and I have no idea where to start. Is there any place in particular I should? You'll get a lot of different answers to that, most of them covered by what Jorpho posted. Or you can do what I did. I read the books in published order and I really enjoyed seeing how the books and Pratchett's writing style changed as the series went on. It's not for everyone and most people will tell you absolutely not to do it, but it's another option. I'm currently reading Discworld novels, in publishing order. For now, I'm finding it a very nice order. As others said, this way you keep going back and forth between storylines, and it's kind of cool. So, anyone else read Raising Steam? I was disappointed. The grags are reduced to the islamist expy. At certain point of book we get a sudden change of scene to random dwarf family, where the father lectures his son about how the grag extremism is bad. If you thought Snuff has a boring villain, this is much worse. I was screaming "show, don't tell!" in my mind half of the book. The beginning is very boring, because there is no real conflict whatsoever related to getting the trains running, it reads like an ending of a fairy-tale. Everybody is honest and well-intentioned and generally good persons. Sir Larry is the honest businessman who struck a fair deal with Mr. Simnel, there is this one troll lawyer made of diamond that never lies and assures everybody that everything is done right. There are some annoying journalists, but their attempts to portray the railway in a negative light are easily foiled. Industrialization seems to arrive to Ankh-Morpork without any significant challenges or problems. I guess this is supposed to be a Moist von Lipwig story, but unlike the previous stories where Moist was the main protagonist, it really doesn't feel like he has much to do or need to put his conman abilities into use against impossible odds. Reacher Gilt and the Bank problems where at least somewhat interesting (I thought how it takes a thief and conman to run a bank successfully and convince Ankh-Morporkians about the idea of paper money not based on valuable-metal standard was even amusing), there he was a element of... immediate crisis, or a problem that couldn't possibly be solved (which of course would be because the good guys win in the end, but there was the question of how). Instead we learn that he can kill three fully armed dwarfs wearing micromail armour by his bare hands. So there's no villains around, except later, because the grags and delvers are now the radicalized generic evil terrorists. It feels like the politics of the dwarf society are not driven by their inner logic at all, but by the will of author to make a point by allegory subtle as a hammer. (There always has been that kind of element in the Discworld stories, but this time it didn't feel... enjoyable). For example, I had hard time recognizing Albrecht Albrecthson as the same character as in the Fifth Elephant; I was expecting some inner conflict between his political opinions and loyalty to the tradition and the legal Low King. Nope, he's a just another boring good guy. interestingly enough for a Watch novel with the Low King storyline, I don't think Carrot was mentioned anywhere in the book. At all. What happened to him? Raising steam stuff follows. Not going to spoiler since it's been out for a bit, but consider yerself warned if you care. I agree that it was weaker, though not to the level of Snuff, I think. Well, maybe. It was against severely lacking in the interesting villain department, and there was no real "how are they going to get out of this scrape" feeling. And I miss the little elements. Some silly scheme by CMOT Dibbler or Nobby or whoever....maybe not the most critical to the main plot, but you get these lively silly b-plots that make the world really come alive. I don't mind a big of allegory so long as the story is good, and so forth, but it really did feel a bit ham-fisted, simply because there wasn't a great deal else there. I know the disc is modernizing and all that, but I still want the stories to feel like light hearted fantasy. Picked up Eric for the first time a little while ago. It's definitely not as refined as the later stories, but the description of Hell is a masterpiece. Is it worth tracking down the illustrated version (one way or another) ? Has anyone here even seen it? The thing I found to like about Raising Steam was the author's enthusiasm for the technology. It's been a while since I read it, but I remember it feeling like the story of the real world development of the steam locomotive transferred to the Discworld. Well, apart from the bit with the flying train. In a way I think Equal Rites was sort of the first "discworld" discworld book. The color of magic and the light fantastic were mostly a D&D game put to paper but Equal Rites was the first that felt like part of the series. I honestly don't know how much of The Shepherd's Crown was Terry and how much was his daughter but many sections sort of felt sketched in. More like fanfiction than a discworld book with lots of "hey, remember that bit of trivial from the discworld books?" moments without much new. The broad sweeps certainly feel like Terry, it feels very much like closing the circle of Equal Rites with the young man who wants to be a witch. But it's mainly a very sad story about big boots. I read an article about how Neil Gaiman said that Terry Pratchett didn't want anything he'd been working on published after his death, because the way he did his writing process (write broad story, then rewrite lots of bits and add in the footnotes and other humorous stuff). I think the reason this last one feels so off is because he hadn't had enough time to do all that. Angua wrote: I read an article about how Neil Gaiman said that Terry Pratchett didn't want anything he'd been working on published after his death, because the way he did his writing process (write broad story, then rewrite lots of bits and add in the footnotes and other humorous stuff). I think the reason this last one feels so off is because he hadn't had enough time to do all that. Yeah I think that fits. Men at Arms is one of the best books I think I've ever read and I read a fair amount. Mort is a distant fourth. It was good but I wasn't as attached to the characters as the other books. I just started reading Feet of Clay last night and I have Equal Rites and Wyrd Sisters waiting for me after that. Mort is where (arguably) Discworld started getting done 'properly', G!G! is where the human-level (magic/belief as mostly background flavour, apart from the Queen naturally) layer of Discworld really started. Obviously it gets 'better', depending on your metric of enjoyment, so I don't begrudge you not putting them as high as the others, and that you're continuing shows that you obviously don't place the scale down low on any Absolute scale, which makes me glad. As a prediction (whilst not actually knowing you) you will probably enjoy WS more than ER. (If you particularly like ER, then you may be interested in not leaving Monstrous Regiment for too long, but I wouldn't rush as there's definitely more City-based books that you really need to read in the interim. And GP, but you've already read that. Which is not to imply the opposite conclusion.) But ER is the prototype/introductory book for the WS-and-onwards subseries. And I make no claims that you'll take to the Witches books (sporadic frequency, sporadic quality, some would say, but definite tour de force moments, depends a lot on the reader) but I think you need to get to the end of WS before actually forming your real 'first' impressions of that arc. It's really hard to order these books because they are all so damn good. I've started Reaper Man but I've got somewhat lower expectations because I didn't like Mort as much as others. I'm hoping I'll be surprised. I also have Making Money waiting for after that but I've heard it's just more of Going Postal. IMO (and no spoilers) you'll accept Making Money as the "difficult second album novel" for Moist but appreciate some of it, but GP, MM and Raising Steam (that latter not as good as I'd anticipated1) are all from the opposite end of the series from pretty much every other book you have their, with an evolved authorial style and intent that makes them quite different. As a different suggestion, there's always Maskerade. The city and the witches and the early-mid phase of the books all converging? 1 Perhaps because of being post-'embuggerance' and over-crafted and overlaiden with 'message'. Different from the madcap "two books a year" phase that most of the others were written in. My problem is I really liked Equal Rites! It had great tone and imagery! It's just getting compared to other amazing books. I have a general feeling that some of the ones I've already read will keep floating to the top and I finish more. I'm not particularly avoiding the Rincewind stuff. It's just I haven't gotten into it yet (what with me only being about ten books into a forty book series). When I do stop them, though, I'll start at the beginning with The Color of Magic. I'm curious to read the other Witch books because I'm liking them as much as the Guard books, just in a different way. I really liked Reaper Man. It was funny throughout. However, orverall, it felt like a mish-mash of ideas. Partly a retelling of what was already covered in Mort and partly themes that were underdeveloped when compared to Men at Arms. I'm about 200 pages into Making Money and it's good but so far it's just a story. It's not speaking to me in any really meaningful way. My favourite is Small Gods because it answers a lot of questions about religion and intolerance. My least favourite is... probably Snuff. Simply because I was already a fan of other fantasy series long before I started reading Discworld novels. So I already had my own opinions about goblins before I read Snuff. Sorry, if this makes me sound like an anti-goblin jerk. Though both were obviously "message" books (being visibly more a parable than satire), for my part I preferred the treatment in SG to the other, for some reason. I'm wondering if it's the darkness (not a bad thing, given Nightwatch's habitual tendency of position in my gently roiling list of best-to-worst) or that it seems to try to fit in an entirely new previously section to Discworld sociology (like SG did, with a Omnia, arguably, but back then there was room for uncharted cultures, without needing to shoe-horn them in). But I've just taken the book from my shelf and put it on my (almost shelf-sized) "to read" pile, because it's been too long to know for sure what I did or didn't see in it, behind the Paul Kidby cover (heavily contrasting with the Josh Kirby cover for SG).